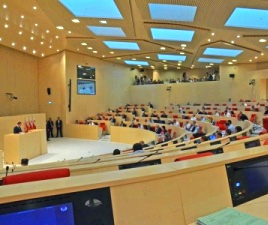 TBILISI, DFWatch–Following fierce debate between opposition and ruling Georgian Dream members, Georgia’s legislative body on Wednesday approved the 2017 state budget by 102 votes in favor and 10 against. The upcoming state budget envisages GEL 9.489 billion (USD 3.796 billion) in revenues and budgetary expenses of GEL 9.121 billion (USD 3.649 billion) for the coming fiscal year. Healthcare, education and infrastructural projects are still priorities for the Government, as the Ministry of Healthcare will receive Gel 3, 415 billion up by GEL 253,8 million compared budget of 2016. Ministry of Regional Development will get GEL 1.258 billion more than GEL 308 million from last year and the Ministry of Education and Science will receive GEL 1.116 billion GEL 138,4 million more than in 2016. Opposition MPs did not participate in the vote, as they believed that the budget proposed by the ruling party didn’t meet the challenges of the country’s economy. Nevertheless, GD had no problem as it enjoys an overwhelming majority in parliament. “This document is a clear recipe for increasing prices next year and it will not contribute to the country’s rapid economic development,” UNM’s Sergi Kapanadze said. “We should save our nation physically. I did not see it in this budget, and therefore I will not support it,” said Irma Inashvili, leader of the Alliance of Patriots. The state budget presented by Finance Minister of the country provides six percent of real economic growth forecast in the mid-term period. The 2017 state budget sets the inflation rate at 4 percent and GEL exchange rate at 2,5 against USD. The state budget assignments were defined as GEL 11.4 billion GEL (USD 4,65 billion). This included budgetary funds of GEL 10.3 billion (USD 4.12 billion), credits of GEL 922 million (USD 369 million) and grants of GEL 154 million GEL (USD 61.6 million). The government estimates a drop in revenues from corporate profit tax from the current year’s target of GEL 980 million (USD 392 million) to GEL 681 million (USD 272 million) next year due to the corporate income tax reform, which is set to go into force from January, 2017. Under the reform, corporate income tax will only apply to distributed profit; while undistributed profits, reinvested or retained, will not be subject to income taxation. The 2017 state budget also envisages allocating GEL 65 million (USD 26 million) to Georgian citizens to allow them to convert their loans from foreign into the national currency. This was only available to people who took out loans before January 1, 2015 which did not exceed GEL 100,000 (USD 37,735). Funding increased for the State Security Service GEL 118 million, up by GEL 18 million compared to last year. Funding for the Public Defender’s Office will increase by GEL 300,000 to GEL 4.8 million next year. Funding for the Georgian Public Broadcaster (GPB) will also increase from this year’s GEL 44.1 million to GEL 46.4 million next year. The 2017 state budget defines GEL 52 million (USD 20.8 million) for the parliament, GEL 16.5 million (USD 6.6 million) for the government’s administration, GEL 9.8 million (USD 4 million) for the president’s administration. Funding for the Georgian Orthodox Church remains unchanged and determined by GEL 25 million (USD 10 million).